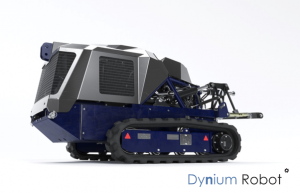 Dynium Robot specialises on autonomous vehicle technology, particularly in GPS poor environments such as poly-tunnels, orchards and shrouded terrain. Performance Projects worked with Dynium Robot from the concept stage in developing the design brief for its autonomous agricultural vehicle. The autonomy of such a vehicle allows different work methods to a manned tractor, resulting in a vehicle very different to a conventional tractor. Performance Projects worked with Dynium in developing the concept, undertaking all of the mechanical design. A tracked undercarriage minimises ground contact pressure, a concern for farmers. At the rear are a 3 point hitch, tow hitches and a PTO (Power Take Off), all conforming to standards allowing the use of existing farm implements and trailers. The plan was for a single initial build, and so tooling costs had to be kept to a minimum. The chassis is made from a kit of self-jigging profile cut steel parts, the basic frame featuring a common plane for easy fabrication on a flat surface, and allowing easy inspection. Functionality took absolute priority, the cowling being designed after the mechanical systems were packaged, the engineering brief including to be simple to mould, and with a multitude of mounting points for sensors. Whilst functionality takes priority on such a vehicle, there was nonetheless the freedom to create a striking design. The brief from Dynium Robot, in part jest, was a single photo of a Lamborghini Aventador. Taking the faceted styling of the Lamborghini, with a gloss paintwork, the intention is that the vehicle would sparkle in the sun as it works across uneven ground. The dark blue of the chassis is the same as the chief designer’s 1968 Fiat 500, and is a nod to Oxford Blue: Dynium Robot is based in Oxford, UK. In allowing Performance Projects to undertake all the mechanical design, Dynium Robot was not distracted from its core skills, the combined expertise of the two companies, bouncing ideas off each other, resulting in a well thought out, revolutionary vehicle. Build of the first vehicle began in 2017 with mechanical systems shakedown in spring 2018. Field testing of its autonomous systems began in summer 2018.